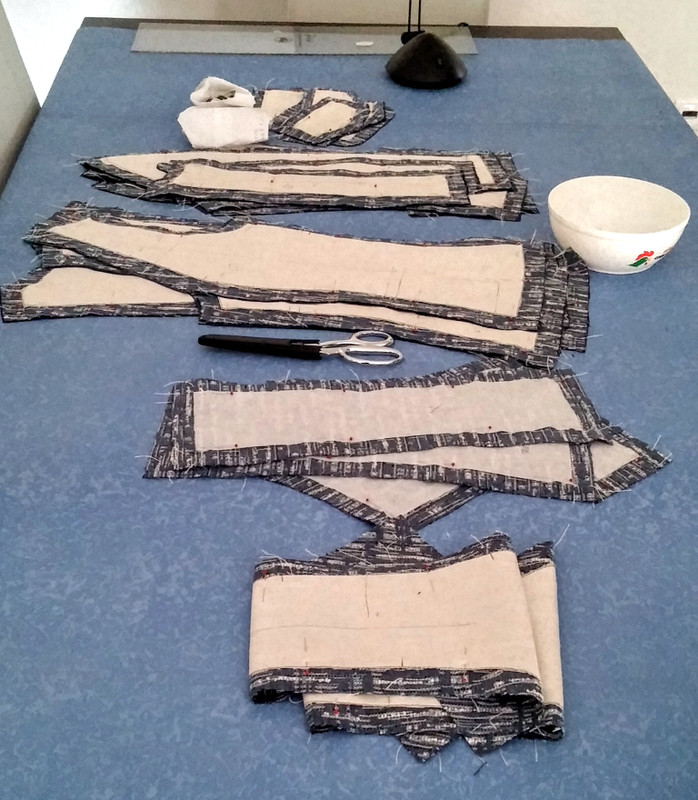 EN Summary: So far all the jacket pieces are cut, including the lining. Every piece has its lining counterpart except the center fronts with all-in one collar and the front facings. It’s time to start thinking on how to deal with the center fronts and collar, in terms of shaping and interfacing. Continue reading to know more! PT Sumário: Até ao momento todas as partes da jaqueta estão cortadas, incluindo o forro. Todas as artes têm um duplicado em forro, exceto as peças centrais da frente com gola seguida e as vistas da frente. É o momento de definir o que vai ser feito relativamente a estas partes, para dar forma à gola e à frente da jaqueta. Continuem a ler para descobrirem tudo! EN: The lining was cut laying out the fabric pieces on top of the lining fabric and re-pinning them to the lining, always minding the grain. I’m happy because I succeeded in using the lining that I first purchased; I was afraid it wouldn’t be enough (it wouldn’t if the center front pieces were to be included in the layout!). I had a backup lining but it was just a little too dark in my opinion. PT: O forro foi cortado dispondo as peças em tecido de forma a repeitar o sentido do fio indicado no molde e prendendo todas as camadas com alfinetes. Fiquei contente porque consegui utilizar o forro que tinha comprado inicialmente (o que temia ser insuficiente). Se tivesse que cortar as partes centrais da rente em forro, este não chegaria para tudo. Estava preparada com outra peça de forro de reserva, mas era um pouco mais escura e prefiro a cor desta, muito próxima à da ganga. EN: I don’t think this is absolutely necessary in this case because the collar is short and it looks OK as it is (check the muslin photo above), but it would make a smother and rounder collar fold… I have to step aside for a couple of days and process all this information and then decide what I believe is going to work best in this case. 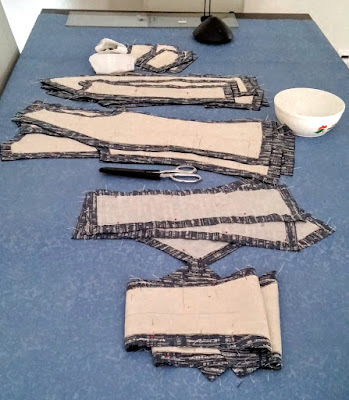 In the meanwhile I'll start with the quilting of the remaining jacket pieces! Thank you all for following along! PT: Não creio que a pinça seja absolutamente necessária neste caso, pois é uma gola curta e parece bem como está (ver foto do modelo de prova mais acima), mas esta pinça faria com que a linha da dobra ficasse mis arredondada e suave… Tenho que parar uns dias e processar toda esta informação para depois decidir o que fazer. Entretanto posso ir acolchoando as outras partes da jaqueta. Obrigada a todos por me acompanharem! Tany, I see the lining is cut back from the edge of the fashion fabric. Are these extra wide seam allowances on the FF? 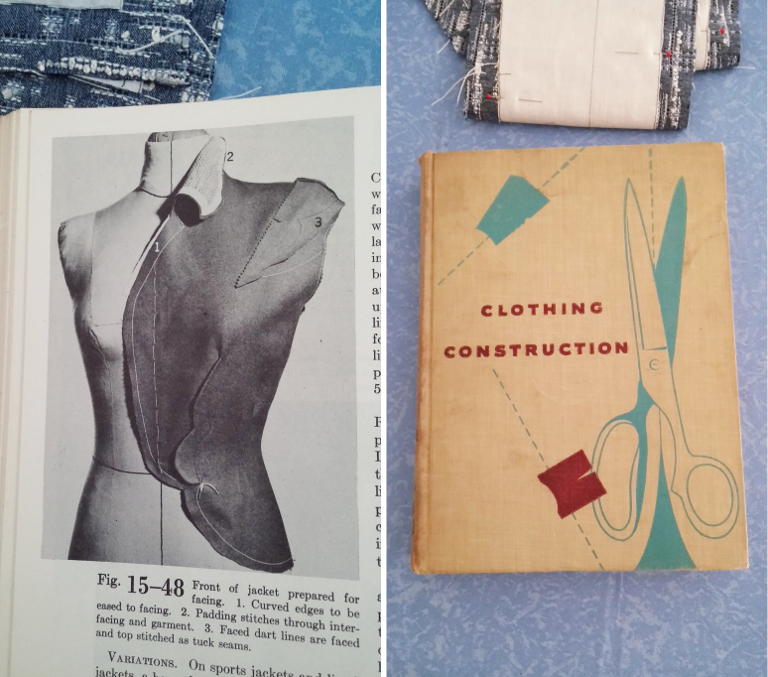 Will you be handstitching the lining seams together a la Chanel? My eye just are wondering where the seam allowances are for the lining. I know you have this all figured out. Thanks for your response in advance. Bunny: I am planning to quilt the lining and sew its seams by hand a la Chanel; maybe it's not obvious from the photo but I am using one inch seam allowance on both FF and lining (I pinned the FF pieces on top of the lining - single layer layout - and cut the lining around them, so the lining SAs are the same or slightly bigger). I didn't use extra large SAs (2 inch) because this fabric doesn't ravel as much as the boucle and I'm also quite sure the pattern fits by now, so no fitting alterations are expected at this point; One inch SA are enough to "cushion" all the seams because that's the default distance between stitching and the edges. 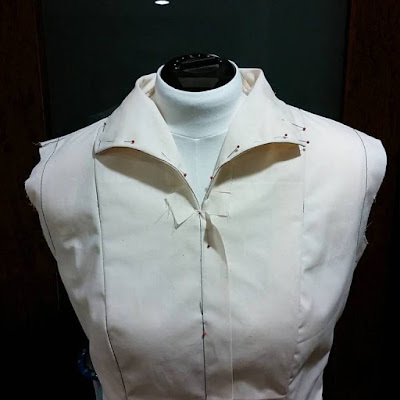 The small shawl collar is interesting and will be following along to see how you end up adding the shape to it. I love the idea of quilting a textured denim. This is going to be special! I STILL haven't posted your buttons - things are a little crazy at work, but I promise to do it this week. I'm having trouble reading the photos of the cut pieces paired with their linings. 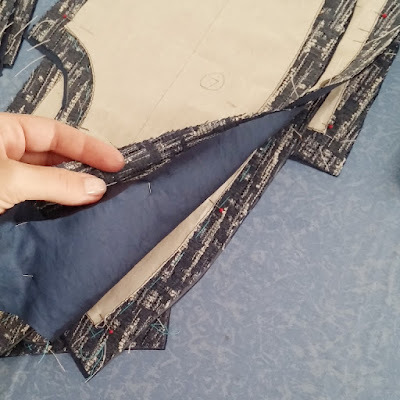 Are the seam allowances of both fashion fabric and lining folded in along the seam lines? This jacket is going to be beautiful - love the fabric. Joan Schott: Thank you! I see the last photo is causing some sort of miss leading,... The lining SAs are the same as the fabric's, I was just pulling them apart for the photo but the angle was not the best, I'm afraid,... I will clarify all this on in my next article.